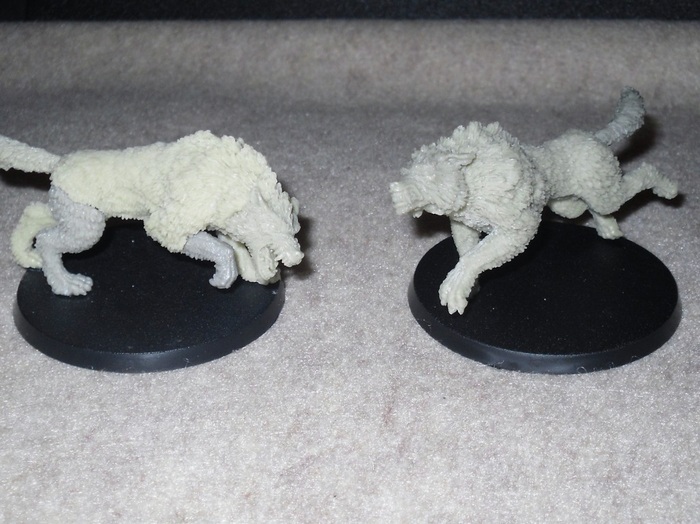 Today I'm here to introduce you to the Great Wolf #1 and Great Wolf #2 models from Micro-Art Studio. These are rather large multi-part models of some quite realistic looking wolves, both finely cast in resin and sculpted by Adrian Gaweł. 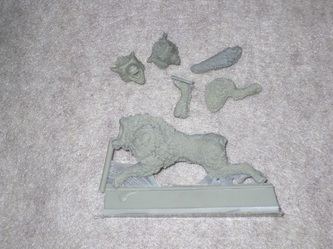 The most common use for these models would be stand-ins for Fenrisian Wolves for a Warhammer 40k Space Wolves army. 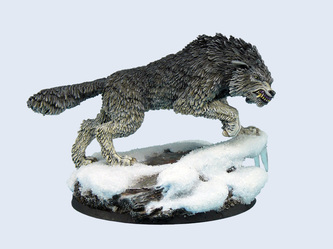 Ironically Games Workshop allows Space Wolves to use Fenrisian Wolves via their Codex, but aside from a single unique hero guy mounted on one, they simply don't make Fenrisian Wolf models. So there's a couple of companies at present making wolves to fill the gap, and these are Micro-Art Studio's rendition. Great Wolf #1 is posed cautiously moving forward, as he surveys the situation. Great Wolf #2 is posed running, or leaping forward, depending on how you decide to base him. That's the main difference between the two models. Both models are also male, because they sculpted them to be anatomically correct, with testicles and all dangling from the rear. I had to chuckle when I saw that. Great Wolf #1 is a 6-piece model, and so is Great Wolf #2. Both models also come with the same two head choices. One head is growling showing teeth, and the other head is sculpted mouth open, ready to sink those teeth into a foe. 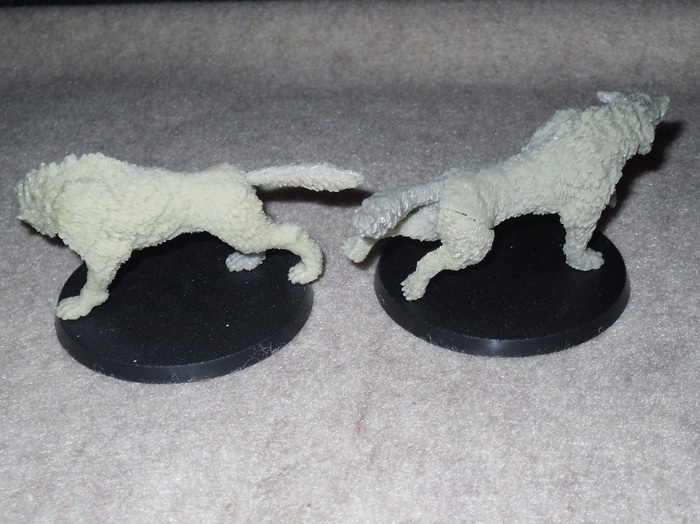 Both Great Wolves comes with front and rear right legs, and a tail separate, and choice of heads from the two available options. All of the parts fit together rather well. Granted there are some mold lines to tend to, but the fur detail make it fairly easy to blend in where it's the hardest to remove. The only time consuming part is cutting away all the flash from the body sprues, but the other separate parts were quite clean. 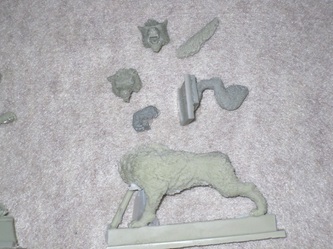 Great Wolf #2 is also as easy to clean up and assemble, except under the chin once the head was in place, it could stand to use a tiny spot of green stuff. The seam on the rear hip where the leg assembles to the body will also require a wee bit of green stuff to blend it in perfectly. With a little creativity and some green stuff, one could easily create a saddle, and some armor as well for these models as well. The only disappointment is, that both of these models don't come with bases. They're also both so large that they'll require no less than a 60mm round base to mount them. They look really nice on a 60mm round scenic snow and rock covered base, which is how the Micro-Art Studio pictures showcase them painted up nicely. But using those would add about another $6 USD each to the cost of the models. I opted for simple GW 60mm monster round base, which isn't something I usually have sitting around. Thankfully I just bought a couple of packs of the GW generic round base assortments for a deal that I couldn't pass up on eBay. So it was pure luck I ended up with having bases lying around to mount these on. The one wolf model can stand pretty good without a base, but the running/leaping model will require a base of some kind to stand at all. Once assembled and on a base these look pretty exceptional. I'm quite impressed with the detail, and both of the head options are equally as cool, so it's hard to say which one is better. All of the little details are clearly defined, and quite crisp in presentation too, especially in the faces. They're definitely big enough that you could mount a Space Wolf model on these models, because the scale is just right. As the top of the page photo reveals, they're definitely the ideal scale for mixing them in with a Space Wolves force for Warhammer 40k as mounts. 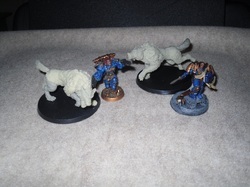 Since GW doesn't make them, these are ideal Fenrisian Wolves for a Space Wolves army. 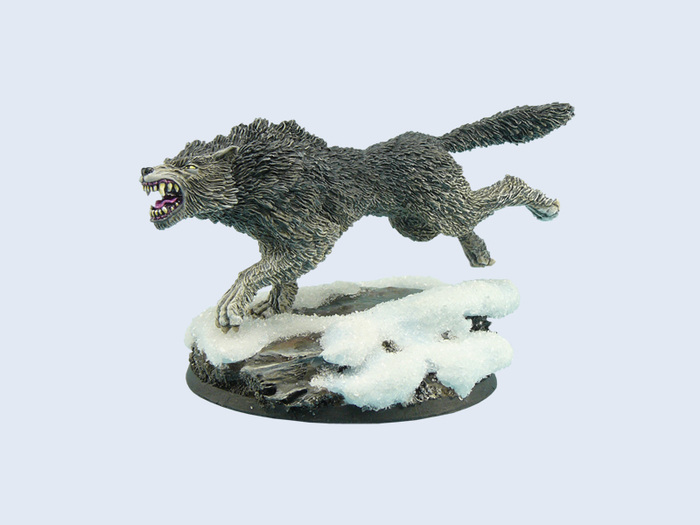 I'm aware that there's a few other large wolf models from other manufacturers available, but these look to be the better ones of the available options out there at present. These are also truly the perfect size. Most of the other options I've seen people using are too small to be mounts as well. The only thing that could be better about them is the price per model, because at $28 USD each these will be a tough sell for the budget-minded gaming enthusiast. However, one could argue that if you play Warhammer 40k, then you are already used to paying Games Workshop's prices for their models, therefore most die-hard 40k players should have no problem with the price of these models. Honestly, quality-wise, these are easily as nice as any GW/FW model, some might even think they're better. I bet you anything that if GW or ForgeWorld created and sold these they'd be $35+ or more each too, based on the size alone. Although I bet GW or ForgeWorld would have included a base. My only ongoing gripe with Micro-Art Studio in general is, that they make great scenic bases but never include even a simple normal generic base of any kind with their models. The least they could do is toss in a single generic 60mm base with these wolves at that price. However the lack of a base doesn't change the fact, that these are still quite exceptional models, with very clean and crisp details. Aside from being fill ins for a Space Wolves army, they'd make nice rather stand-in large werewolves/lycans/direwolves to be used in most any skirmish game in the 28mm-35mm range just the same.